The chain pickerel is distinguished from its relatives, the Northern Pike and Muskellunge, by its prominent chain-like markings on a contrasting lighter green background. Chain pickerel are fully scaled on both cheek and gill cover. They are characterized by a slender body, which is somewhat compressed and deepest near the middle. Head is large, naked, and depressed above. Chain pickerel have a conspicuous dark bar beneath each eye and the pupil of the eye is yellow. Large mouth and a sharp set of teeth. Dark upper side interrupted by light vertical bars. The chain pickerel's original range was Atlantic and Gulf Coast tributaries, but the fish has been introduced elsewhere. Chain pickerel are the smallest gamefish in the Esox (Pike) family. Pickerel are attracted to weedy pools in streams, ponds, lakes and rivers. Chain Pickerel spawn in the early spring when water temperatures approach 50°F. Pickerel eggs are adhesive ribbon-like masses that are attached to submerged vegetation or structure. The female lays up to 50,000 eggs but does not stay to guard them as many other fish do. 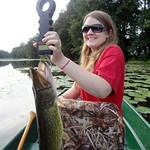 Pickerel are excellent sport fish which provide anglers with a year-round fishery. They are sought after by diehard anglers in the coldest part of the winter and can be caught in the middle of the summer as well. Pickerel are good fighters on light spinning and fly tackle and will readily take a live minnow, streamer fly, spoon, spinner or a variety of other lures. Just keep in mind that a steel or heavy monofilament leader will help you to land more of these toothy critters. Some of the more popular places in Maryland to fish for pickerel include, Deep Creek Lake in Garrett County, Little Pool in Washington County, Magothy and Severn Rivers in Anne Arundel County, Loch Raven Reservoir in Baltimore County, and St. Mary's Lake in St. Mary's County. Eastern shore waters include Tuckahoe Lake, Johnson's Pond, Smithville Lake and numerous tidal tributaries of the Chesapeake Bay. Pickerel tend to be solitary fish, lurking hidden in the aquatic vegetation, waiting for prey to swim or drift by. Chain pickerel are aggressive fighters once hooked, thus making them an exciting catch. ​For more information on chain pickerel and their management, please contact Todd Heerd at 410-442-2080.